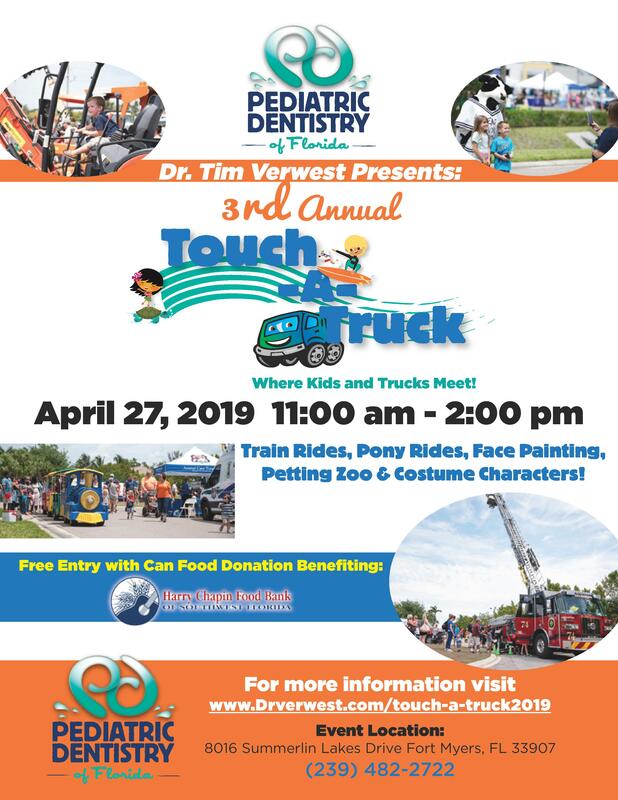 Pediatric Dentistry of Florida, Dr. Tim Verwest, DMD & associates is hosting the third annual family-friendly ‘Touch-a-Truck’ Fort Myers on Saturday, April 27, from 11 am to 2 pm. This free interactive experience creates a safe place for children learn about work vehicles in their community. Touch-a-Truck is a hands-on experience where children will be able to learn about their favorite trucks and vehicles, plus interact with those who drive them. Children will be able to be as if they were the true professional behind the wheel. Featured vehicles will include emergency service, law enforcement, military, public service, and local commercial businesses. Other activities include trackless train rides, pony rides, and face painting, photo booth, and costume character meet & greet. Please bring can food donations benefiting the Harry Chapin Food Bank for entry. There will be a special ‘horn-free’ hour from 11 am to 12 pm for children with special needs and sensitive ears. Touch-a-Truck is free to the general public and is located at Pediatric Dentistry of Florida, 8016 Summerlin Lakes Dr, Fort Myers, FL 33907.